The days are slow and easy; no care-giving or worry about the physical or emotional pain of a loved one. Mom, dad and I have had a lot of practice living together in this tiny house over the last several years. We all have our own mini orbit and rotate around each other quite smoothly. That’s the slow and easy part of my story. The crazy over-my-head part includes this art thing. Like her mother before her, my mother is a prolific visual artist. She dabbles in all sorts of painting media; oil, acrylic and water color. Grandma pushed her art even further and used charcoal and chalk also. She worked leather and embossed copper and had her own ceramics shop. About 25 of Mom’s paintings will be hanging in a gallery/cafe in Eagle River during the month of September. She is a shy and humble artist and will not let me plan a meet and greet opening event. 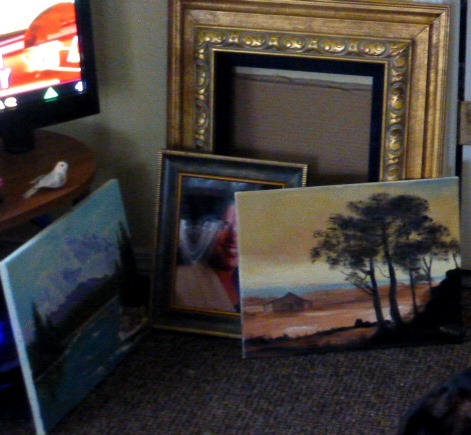 Meanwhile, guess who is framing these paintings? You got it, me. I have never framed anything in my life, okay, besides a photo or two in a ready-made frame. I was over my head with the first painting. I’ve learned a lot as I moved on to the next and the next. I think I have about 16 finished. I’ll probably go back to the first few and re-do them. 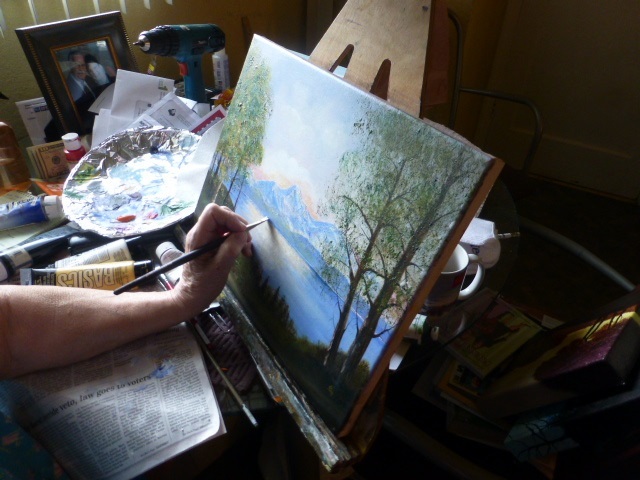 Mom continues to paint, so the tiny house is filled with framing materials, a large tote of finished work, mom’s easel and paints and brushes, and paintings leaning every which way, in various stages of completeness. Some are even drying out on the deck. Visitors and the three of us have a choice of one or two places to sit, if we are lucky. When will this madness end?! 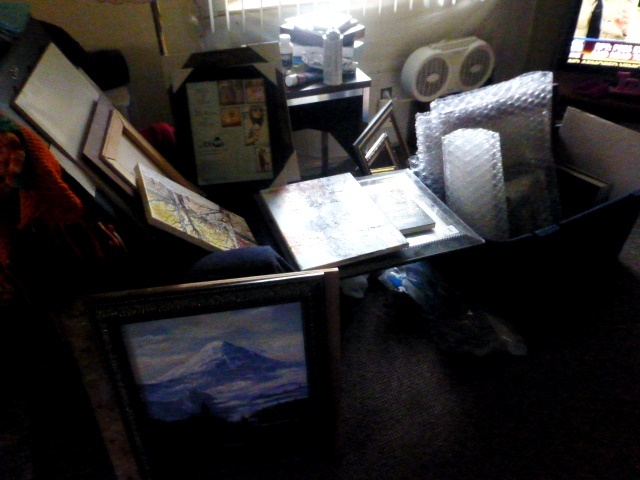 Ten more days, and we will take the whole lot to the gallery. I still have to write ads and make a template to label each painting. The joy here is watching my mom work her talent. Grandma died in 1977, but she is all around; in the smells of paints, the materials all about, and in the similarity of their (mostly) Alaska painting scenes. I lived with my grandma for a month when I was about 14. 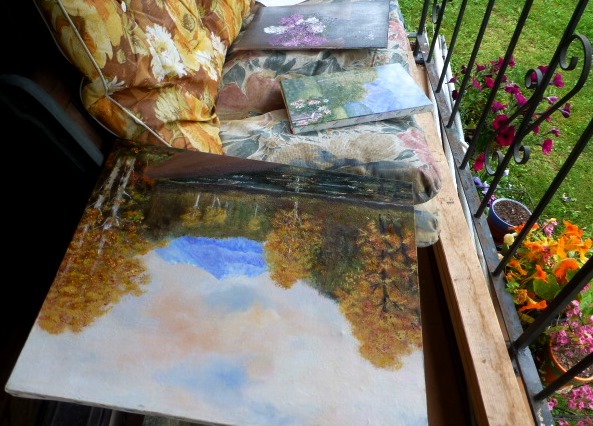 Her home was filled with the same smells and art materials and inspiration. I’m as inspired and amazed by mom’s talent as I was of grandma’s. I’m still deciding whether I should thank or curse my sister who sent me the ticket to be part of this craziness. Maybe a little of both. Categories: ALASKA Travels, LOVE Family & Friends, Phall Photos | Tags: Alaska, Art, family, painting | Permalink. Oh, I thanked her the day I got here. She knows how much I appreciate it. And I am having a blast. I am blessed with a wonderful, generous family! You are all quite talented. Now I see where you get your eye for the camera. Very good to be able to spend time with mom. I know she appreciates you. As always I love your moments and insights…..love and hugs to ant and unc for me! She is talented and I love watching her work. Thanks, Miranda. What a hugely talented family. The artwork we can see is fantastic. I don’t envy you the job of framing at all as it’s such a precise job. I’m glad you’re having a good time there though visiting with your Mom. I hope you have your camera there. I have already taken over a thousand photos, mostly flowers and mushrooms. Will post as I can. How awesome that you’re supporting your mom (and in spirit your grandma) in her artistic endeavors! Have you, too, inherited the gift? There is so much to paint in AK, with words as well as paint media. All the best. I express myself better with words and photos, Susan. I adore wet-on-wet watercolor, but haven’t dabbled in it since my children were small. I would be thrilled if mom and I could spend part of September creating art together. Mom also supports me in every way. She flew to Washington during my husbands last days and again when my 3-year-old grandson died. Not everyone has this kind of family support, and I do count my blessings every day. Cherish the time with your Mom and Dad. Making memories are a sure-fire way to keep our parents alive even after they pass on, as I have learned from recent experience. How interesting to see your Mother’s art and you supporting her talents. Yes, it’s worth it! Marian, your recent loss has made me appreciate them that much more. Take care and I’m glad you are here. Bzzzz. And always over my head! Glad to make you smile, Debby. Amazing scene with your mom. What an interesting woman. You’re giving her the art show of her life, introvert or not. I’m grateful for all of you, Patti. You can thank and curse and thank again plenty of times.